Open Mon.-Thurs. 10 a.m.-9 p.m., Fri.-Sat. 9 a.m.-11 p.m., Sun. 9 a.m.-9 p.m.
: Established in 1720, this cafe is Italy's oldest. 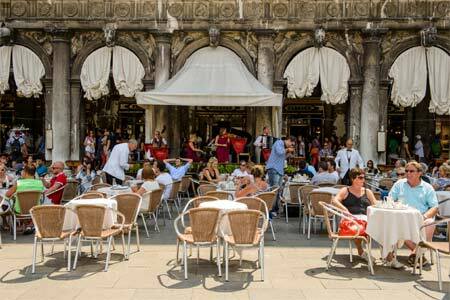 Have lunch or a late breakfast on the terrace of Caffè Florian and admire the sights of Venice's Piazza San Marco. The menu features light bites like salads, sandwiches and quiche, along with a couple pastas. If you have a sweet tooth, you'll be tempted by the many cakes and gelati desserts. Specialty coffee drinks, Italian beers and wines, and cocktails are also available.